This short shrub-dominated community (usually less than 1 m in height) is often part of the classic floating/quaking bog-mat community matrix found in glaciated areas of northern Pennsylvania. This community type usually occurs in oligotrophic, peat-accumulating basins as part of the acidic glacial peatland complex. Substrate is organic and may be flooded at times but remains saturated throughout the growing season. 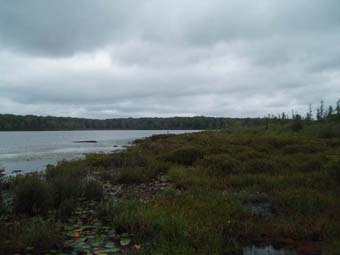 The peatland where this community usually occurs may be oligotrophic or influenced by groundwater. Leatherleaf (Chamaedaphne calyculata var. angustifolia) is the dominant shrub. Associate species include sheep laurel (Kalmia angustifolia), bog-rosemary (Andromeda polifolia var. glaucophylla), purple chokeberry (Photinia prunifolia), black huckleberry (Gaylussacia baccata), and Labrador-tea (Rhododendron groenlandicum). Herbaceous species include pitcher-plant (Sarracenia purpurea), round-leaved sundew (Drosera rotundifolia), white beak-rush (Rhynchospora alba), cranberry (Vaccinium macrocarpon), and tawny cotton-grass (Eriophorum virginicum). There is usually a continuous sphagnum layer. This type occurs on organic soil, sometimes on a floating mat. This community type may occur as part of the acidic glacial peatland complex. Vulnerable in the jurisdiction due to a restricted range, relatively few populations, recent and widespread declines, or other factors making it vulnerable to extirpation. *Vascular plant nomenclature follows Rhoads and Block (2007). Bryophyte nomenclature follows Crum and Anderson (1981). Fike, J. 1999. Terrestrial and palustrine plant communities of Pennsylvania. Pennsylvania Natural Diversity Inventory. Harrisburg, PA. 86 pp. 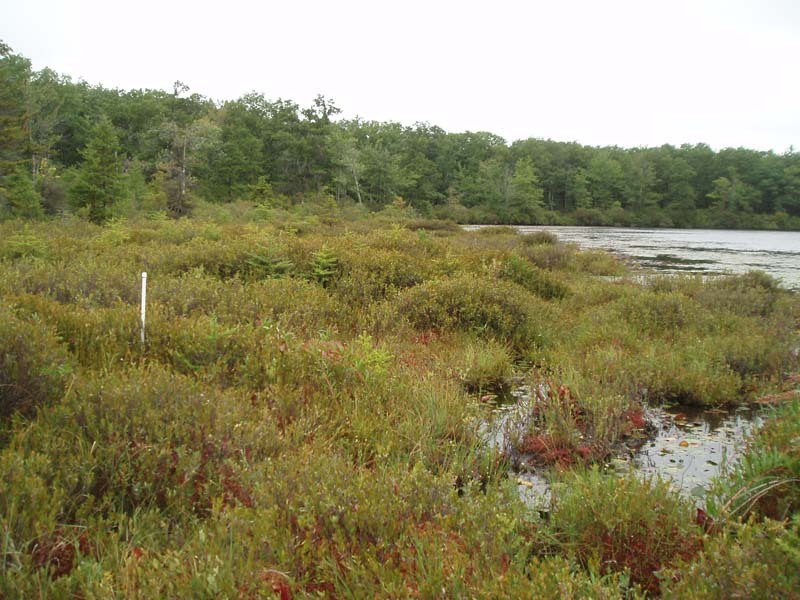 Leatherleaf – Bog-rosemary Bog is most similar to Leatherleaf – Sedge Wetland and Leatherleaf – Cranberry Bog. 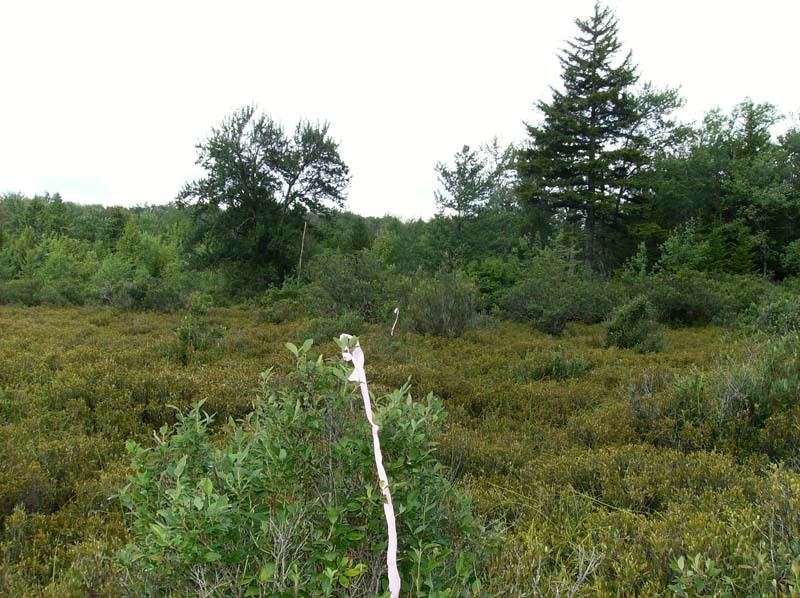 In terms of pH and nitrogen availability, Leatherleaf – Bog-rosemary Bog is probably the intermediate between the other two leatherleaf types. Leatherleaf – Sedge Wetland generally has associated species that are less ericaceous and insectivorous plants are less common than the other two leatherleaf communities. 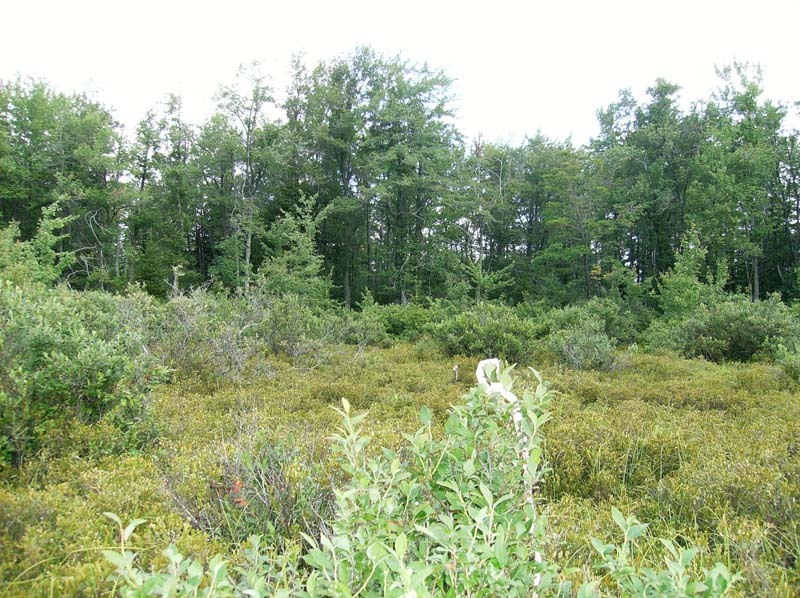 Leatherleaf – Bog-rosemary Bog has a taller and denser shrub cover and more associated species than Leatherleaf – Cranberry Bog. Rare plant species that may be found in this community include bog-rosemary (Andromeda polifolia var. glaucophylla), dragon’s mouth (Arethusa bulbosa), many-fruited sedge (Carex lasiocarpa), mud sedge (Carex limosa), few-seeded sedge (Carex oligosperma), bog sedge (Carex paupercula), few-flowered sedge (Carex pauciflora), twig-rush (Cladium mariscoides), rough cotton-grass (Eriophorum tenellum), white fringed-orchid (Platanthera blephariglottis), Labrador-tea (Rhododendron groenlandicum), pod-grass (Scheuchzeria palustris), and horned bladderwort (Utricularia cornuta). This community also serves as a buffer for sediment and pollution runoff from adjacent developed lands by slowing the flow of surficial water causing sediment to settle within this wetland. Leatherleaf – Bog-rosemary Bogs are threatened by habitat alteration (e.g., conversion to agricultural land, logging in adjacent uplands), deposition (e.g., sedimentation, nutrient loading), and alterations to the hydrological regime (e.g., removal of beaver dams or other impoundments, lowering of the water table). This community type may be more susceptible to degradation due to the fact that it is often associated with small, isolated basins. Plant collection pressure may add to the degradation of this community type. Leatherleaf – Bog-rosemary Bogs are pH < 4.0 and low in nutrients, they are susceptible to alteration by elevated nutrient inputs. This wetland may require larger buffers than other wetland types because of their high susceptibility to changes in nutrient concentrations. 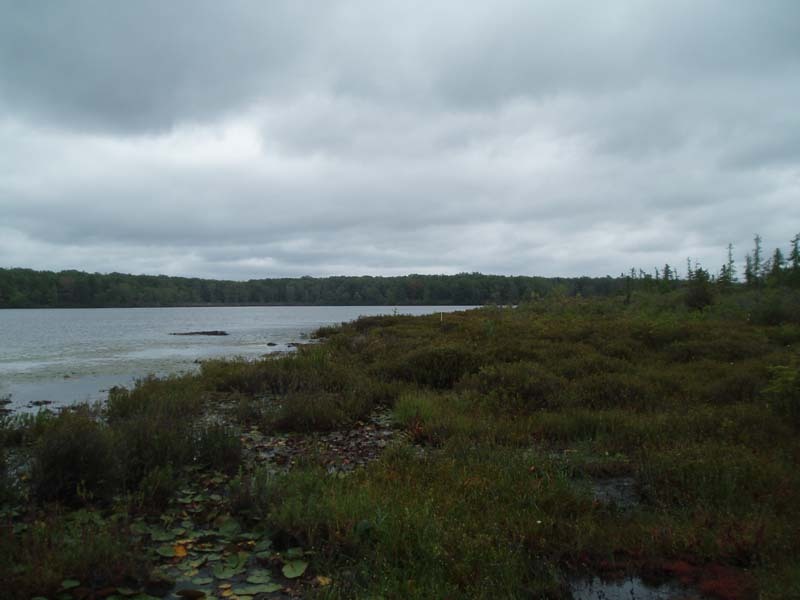 A natural buffer around the wetland should be maintained in order to minimize nutrient runoff, pollution, and sedimentation. The potential for soil erosion based on soil texture, condition of the adjacent vegetation (mature forests vs. clearcuts), and the topography of the surrounding area (i.e., degree of slope) should be considered when establishing buffers. The buffer size should be increased if soils are erodible, adjacent vegetation has been logged, and the topography is steep as such factors could contribute to increased sedimentation and nutrient pollution. Direct impacts and habitat alteration should be avoided (e.g., roads, trails, filling of wetlands) and low impact alternatives (e.g., elevated footpaths, boardwalks, bridges) should be utilized in situations where accessing the wetland cannot be avoided. Care should also be taken to control and prevent the spread of invasive species within the wetland. Alterations to groundwater sources should be minimized. Research is needed to fill information gaps about this community type, especially to advance our understanding of their classification, ecological processes, hydrology, floristic variation, development, and succession. Wetland protection has most likely stabilized the decline of this community, which was heavily impacted by peat mining activities. There may be cases of slight decline due to alteration of hydrology from impoundments (conversion to other palustrine community types). 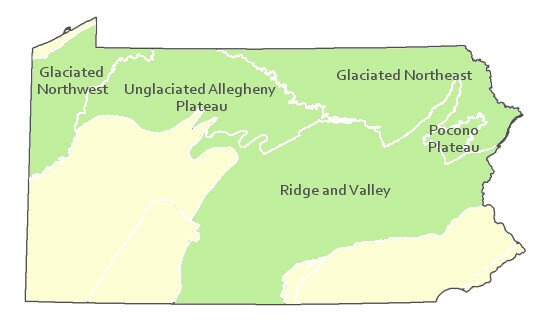 Allegheny Plateaus Province, Glaciated Low Plateau, Glaciated High Plateau and Glaciated Pocono Plateau Sections. Connecticut, Massachusetts, Maine, New Hampshire, New York, New Jersey, Ohio, Pennsylvania, and Rhode Island. This community type also extends into Ontario. Edinger, G.J., D.J. Evans, S. Gebauer, T.G. Howard, D.M. Hunt, and A. M. Olivero (editors). 2002. Ecological Communities of New York. Second Edition. A revised and expanded edition of Carol Reschke’s Ecological Communities of New York State. New York Natural Heritage Program, New York State department of Environmental Conservation. Albany, NY. 136pp. Fike, J. 1999. Terrestrial and palustrine plant communities of Pennsylvania. Pennsylvania Natural Diversity Inventory. Harrisburg, PA 79 pp. NatureServe. 2005. NatureServe Central Databases. Arlington, Virginia. USA. Pennsylvania Department of Conservation and Natural Resources (DCNR). 1999. Inventory Manual of Procedure. For the Fourth State Forest Management Plan. Pennsylvania Bureau of Forestry, Division of Forest Advisory Service.Â Harrisburg, PA. 51 ppg. Perles, S.J., G.S. Podniesinski, E. Eastman, L.A. Sneddon, and S.C. Gawler. 2007. Classification and mapping of vegetation and fire fuel models at Delaware Water Gap National Recreation Area: Volume 2 of 2 – Appendix G. Technical Report NPS/NER/NRTR – 2007/076. National Park Service. Philadelphia, PA.
Stone, B., D. Gustafson, and B. Jones. 2006 (revised). Manual of Procedure for State Game Land Cover Typing.Â Commonwealth of Pennsylvania Game Commission, Bureau of Wildlife Habitat Management, Forest Inventory and Analysis Section, Forestry Division.Â Harrisburg, PA. 79 ppg. and the Pennsylvania Fish and Boat Commission.